By Converse, size large. Classic shearling 'heavy shoe' with a zipped front and thick rubber sole enveloping the entire foot area to increase water resistance. Designed to be worn with or without a regulation shoe and also electrical shoes and inserts such as the D-1. These rare early variants lack the modifications made due to instances of the boots falling off during a bail-out or walking in mud. 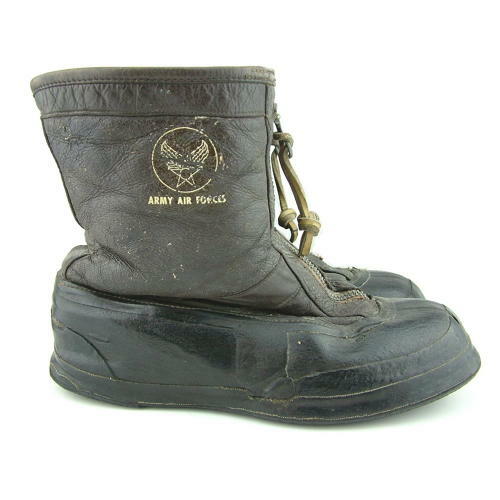 Many had buckled straps added at the instep and upper edge to prevent this and later production boots had these incorporated at the factory (A6-A). The leather is generally in very good condition. It remains supple and is largely free of the crazing, peeling and damage common to these boots. Note that there is some crazing and peeling in places, notably to the external side of the left boot. The original Crown banded zips are in full working order (would benefit from lubrication) and complete with leather puller tags. The rubber soles and 'galosh' sections have hardened, are inflexible and there is some rubber loss, cracking and small repairs. Good thick fur pile linings. Insoles in each boot. Labels on each zip tongue and AAF transfer on right boot. Not perfect but very presentable and really quite difficult to find now. Stock code B22279.